Dive into a colorful, rustic ambiance with this beautifully-made accent table. It works perfectly as an end table by the sofa or next to the bed for holding all your favorite knickknacks or bedtime essentials. The table features a drawer to keep a hold of those small objects which seem to always get away and an open cabinet space which is ideal for keeping up with magazines, books, blankets or bedding. The piece was crafted with a combination of new, kiln-dried ponderosa pine and genuine wormwood accent planks between 50 and 250 years old and was finished with a rich, honey-colored wax to bring the wood grains to life. 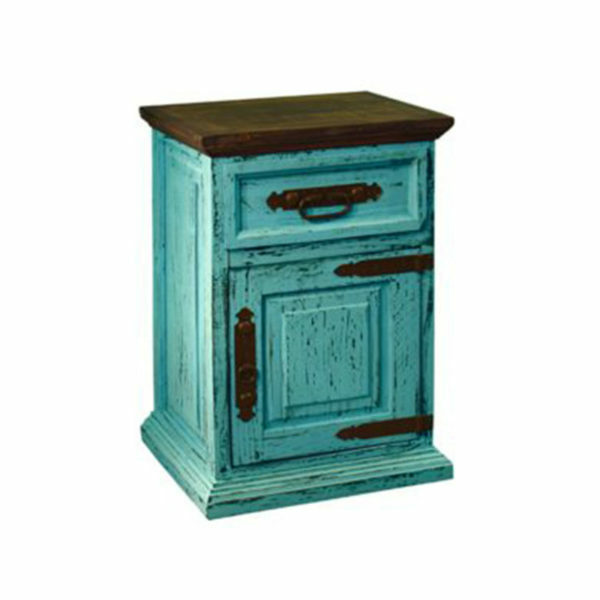 All iron and hardware is hand-forged with a distressed, rust-colored finish. Every piece is 100% solid wood and carries a one-year warranty.